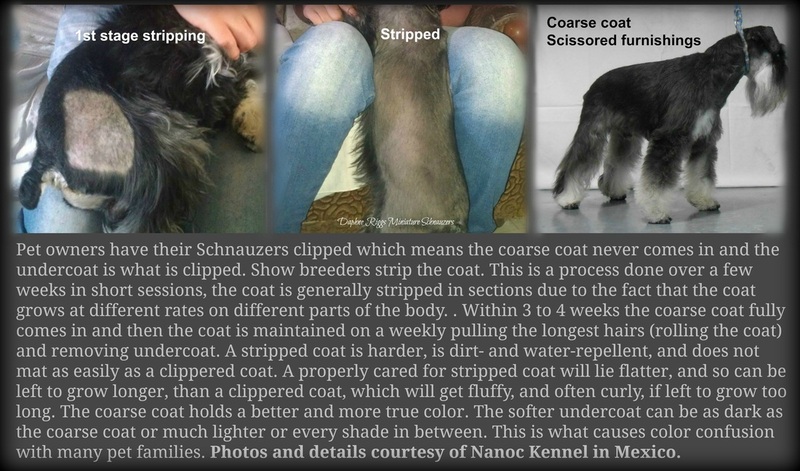 This page has information regarding AKC recognized coat colors and what stripping and clipping does to a coat. What colors are recognized and registered by the AKC... you might be surprised -- the Internet has a lot of hype & incorrect information. Standard vs. nonstandard coloring can be confusing because of A LOT of incorrect information provided on many websites on the Internet but the AKC makes this easy to understand. The AKC "show" colors or standard colors are (Black), (Salt & Pepper), and (Black & Silver)... Easy enough to understand. 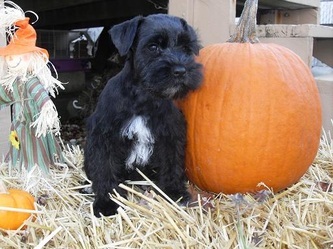 However, the AKC is also aware of genetics and that other breeds were bred into a Standard Schnauzer to produce the Miniature Schnauzer (like a Poodle). This is why the AKC has registration codes for nonstandard colors as well. Here are the color codes for the AKC approved nonstandard coloring; (Liver 123), (Liver/Tan 124), (Liver Pepper 498), (Parti 038), (Wheaten 224), and (White 199). Standard colors are black based, which means the nose and pads will be black. Nonstandard colors are brown or black based, which means the nose and pads are brown or black... Incredulous... who knew!! *When you research the AKC standards for a Miniature Schnauzer the colors listed are the 3 standard colors. However, when you go to the AKC website and research further -- you find the nonstandard accepted colors. 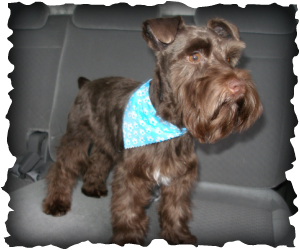 The goal when breeding down for a Miniature Schnauzer was to get the 3 colors found in the Standard Schnauzer, which is the orginal Schnauzer. The Giant and the Miniature were bred up and down in size by using other breeds, which introduced the nonstandard colors. 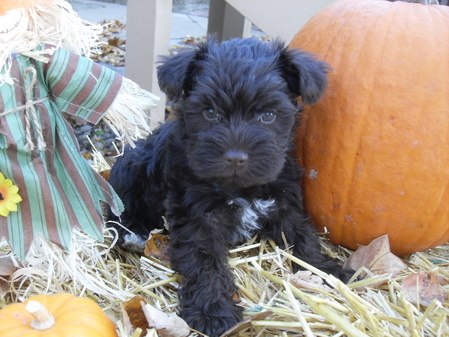 The Miniature Schnauzer breed was established by breeding the Standard Schnauzer with other smaller breeds such as the Affenpinscher, Miniature Pinscher, and even the Miniature Poodle. As breeders worked towards stabilizing the gene pool, mismarked, parti-colors, and white puppies were removed from the breeding programs. ~Quoted from the Hub Pages Miniature Schnauzers~. This was done in the late 1800's to the early 1900's. Not all breeders/kennel owners discriminated against these colors and chose to secretly keep them back and breed them regardless of what others said about the "acceptable colors". Parti Schnauzers are registered now and always have been since the early 1900's through AKC. They cannot compete in confirmation unfortunately, because the AKC did not keep their promise to fully register these beautiful Schnauzers like they originally agreed to do. PARTI --Resurrection of the almost extinct Parti Schnauzers. 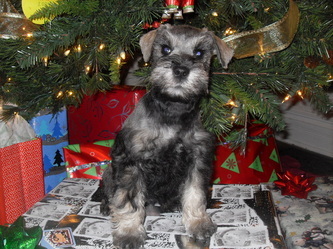 The original Parti color Miniature Schnauzers were found in Germany 1880. They were official registered with the German Pinscher Schnauzer Club PSK in 1929. Unfortunately, lots of the Parti Schnauzer's breed history was destroyed during World War II in Germany. During the Third Reich in 1933 the board of the German PSK decided to ban all Parti Schnauzers and most were eradicated. One of the main reasons given for the ban was that Parti Schnauzers looked to similar to the Wire Hair Fox Terrier which would confuse the public. Another reason was that Partis would hurt and interfere with the sales of Salt & Pepper puppies of loyal Club Members. Sadly all Parti Schnauzer vanished from Germany and Europe. A few breeders did continue breeding the Partis secretly to avoid being kicked out from the SPK and gave those color Schnauzers away or smuggled them out of Germany in hopes to preserve just a few for future breeding. The Parti Schnauzers history is older than that of the Salt & Pepper Miniature Schnauzers. Although the Germans PSK was determined to ban and destroy all the Partis, some did survive the Parti Schnauzer Holocaust .Only recently have US Breeders picked up the gap of 80 years and are resurrecting the almost extinct colors. 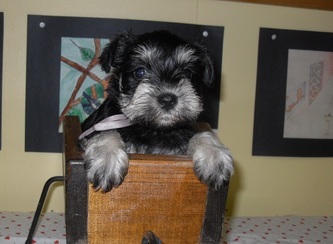 Breeders of the Parti Schnauzers are still being looked down at with disgust by Show Breeders who believe that Salt & Pepper, Black & Silver and solid Black are and should be the only Standard colors for the Miniature Schnauzers. Parti Schnauzers are 100% Schnauzer and are a not a mix or cross breed (Merle and Confetti Schnauzers are a mix/hybrid and are not registered through the AKC). While they are disqualified from the show ring due to color discrimination, such dogs are recognized as purebreds by the AKC and can be registered! USA. So, while they can’t compete in the Show Ring, there is nothing wrong with the other colors as many like to argue. 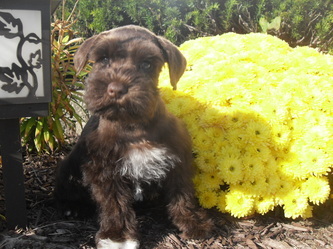 They are 100% purebred Schnauzer, and can be duly registered (AKC). Further, the Parti and other colors are extremely "old blood", found in most of the early lines. ~~~ http://www.psk-pinscher-schnauzer.de/ ~~~ Pinscher-Schnauzer-Klub 1895. This is the club that promised the Abbagamba Kennel in Germany that Parti Schnauzers would be registered completely to the point where they can acquire points in any show or competition that they are entered and compete in and would excel!